​The GOLDEN VORTEX Magnetic Health Device came about as one of those unintended consequences that happen when a lot of time is spent trying to accomplish something else. While trying to make an “electric” motor using only permanent magnets I stumbled across previously unknown anomalies in the characteristics of magnetic spin fields. Studying these irregularities revealed how to alter these fields so that alleviation of pain occurs when applied to the body. I showed in my 2000 book, The Golden Vortex, how to change the field of a single magnet for health goals, however, the use of a one magnet for this objective proved to be too complicated and tenuous for general use. 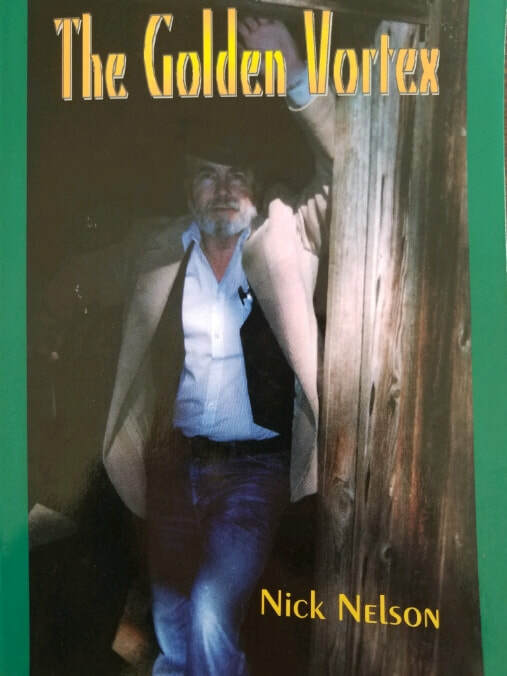 The Golden Vortex was mostly about my experiences in the oldest and best known tourist spot near Gold Hill, Oregon called, The House of Mystery at The Oregon Vortex. Here, and in at least 8 other locations around the USA reality is a bit out of whack to say the very least. A range of other than normal phenomena occur at these places, the most celebrated of which is that people seem to actually change sizes as they switch places with one another on short platforms. As an example of this particular observable fact the opening page of this website shows two poles at The Montana Vortex. The poles are on either side of a line of demarcation that is found at ground level. Reality is literally different on one side of that line than it is on the other side. The cause of these kinds of spectacles is unknown, but the general consensus is that it is probably the result of magnetism gone wild, affecting body mass, if not just the path of light and gravity. These kinds of incongruities seem to be the result of raising the quantum to the level of everyday life! Many feel that these demarcation lines are examples of what’s referred to as “Zero Points”, an infinite dot or knife- edge line where universal energy might be accessed to provide free power. I feel many kinds of things are available at the Zero points, and one factor is that it is a portal giving access to the biology and nervous systems of living beings. In 2004 I moved to Montana to consult with the new owners of The Montana Vortex. To my surprise I found the Montana anomaly to be structurally different from any of the others. I arrived knowing that all Vortexes conform to the Fibonacci Sequence, in that like snail shells, or pine cones nature determines that a spiral shape works very well to protect the snail or pine seeds. But when the vortex spirals get tangled up with each other the result is a unique range of phenomena. When a single Vortex directly combines with another single Vortex new things are made, and assembling combinations is what makes inventors successful! There are at least six smaller Fibonacci points in a single vortex, and at the Oregon Vortex, or any of the others “Fibonacci number three” is the point where health factors are directly addressed. At the Montana Vortex, though, THREE vortexes are mutually entwined and as a consequence many new and different combinations of fields have created additional magnetic patterns not found at any of the other sites. I cataloged and studied these patterns, and then learned how to duplicate them. In the Vortex the least important thing is positive/negative polarity. The Vortex is electromagnetic in nature but will not pick up gobs of paper clips, nor will it make electricity in the classic sense of passing a magnet at 90 degrees across a copper wire. Polarity in the Vortex shows up in the form of SPIN; either clockwise (CC) or counterclockwise (CCW). When CC interacts with another CC, or with CCW in an orthogonal sense (90 degrees) the Zero point is accessed from new angles forming new lines of demarcation. Poles and people shrink and grow. “Healing” points show up at different points with different results. One elderly lady suddenly did a Rockete kick and shouted at me, “Look at this!” I was impressed, but then she announced that this was the first time in months her hip replacement was free from pain. Then I was really impressed! Other people reported that their arthritis stopped hurting, or their headache went away. One young girl was limping badly from a knee injury when she came in but walked out limp free. I tracked many of these testimonies until a map took shape; a map that I was finally able to replicate with simple permanent magnets. Replicating the energy in a flat disk that is normally given off by a more 3-D apparatus demanded making many, many copies. Finally I was able to achieve the effect, and in so doing learned even more about magnetic fields and how the body and brain responds to their presence. In The Golden Vortex I show the Egyptian Ankh made of 3 magnets forced into the shape seen in the middle illustration below. The true Ankh may have even been carved from a solid piece of magnetite, but in either case the magnet model imparts an interesting field of magnetic force; a force I first encountered in the Montana Vortex. An almost serene energy is felt from every Ankh magnet model I’ve made. Some Egyptian wall carvings depict this tool in the hand of a priest pointing it at another person. But more often it is simply held, perhaps conveying benefits to the holder? At any rate there seems to be ancient knowledge hidden in the Ankh symbol. In hieroglyphics the figure is supposed to be the word for life, but how was it used in everyday practice? Clearly it is a dominant fixture in ancient Egyptian art, but why? Did it have a function the subtleties of which are thousands of years lost to us because of the crude form of depiction that is now our only way to try and comprehend it? My magnet discoveries forces me to believe it was a wand of sorts that magnetically interacted with the sympathetic nervous system to help keep the body and mind balanced and healthy. The Golden Vortex reunites the LIFE symbol with our present reality. Maybe get rid of this whole thing! Near the edge of the largest of the three anomalies at the Montana Vortex a grove of trees have grown naturally in a pretty good facsimile of a circle. The trunks of the trees are bent and twisted CCW for the first 10 or 12 feet of their height, and then above the energy that caused them to twist they grow straight up. Inside this fascinating 14-foot diameter line of circular energy the vast majority of several thousand tourists a year are able to hold their hands out over the ground and see the faint reality of their own auras surrounding their fingers. Most see outlines and a white misty/filmy effect around their hands. Some folks can pick out colors, but most see only the cloudy effect. This picture was taken with bright sunlight on the hand but seen against the dark backdrop of the dirt. The camera didn’t pick up the effect as well as the eye, but it’s noteworthy that a common digital camera can bring up the image at all. When the Golden Vortex is anywhere on your person that grove of trees will figuratively surround you. With your hand bathed in light and looking at it against a dark backdrop you will see your own, and other’s auras, and with practice the effect becomes more pronounced. The GV device duplicates the effect of the Montana Vortex’s Aura circle! Most of us have probably heard about a group of extraordinary people who live in a far northern valley of Afghanistan called Hunzas. Their particular claim to fame is that they typically live in good health beyond a century and some of them live many years past a hundred. Some of the Hunza men have even sired children at these extreme ages. Science for many years has tried to figure out their secret. Everything in the Hunza’s valley has been analyzed; dirt, food, air, genetics, but nothing was found until it was noticed that water samples looked different under a microscope. The water molecules were a bit strange. Evidently regular water molecules “clump” up in pentagonal shapes, but the Hunza water is arranged in hexagons ... six-sided shapes, and this seems to be the answer to the riddle of Hunza health and longevity. Some claim that the atoms making up the hexagonal water are smaller and therefore can penetrate biological cells better than “normal” H2O’s. At any rate the suspicion as to why this new arrangement is different is because the Hunza water is radiated by direct sunlight while it is also atomized by falling from very high cliffs into their valley. I, on the other hand, have long suspected that lurking in this part of the world is a very large Vortex (as in Bermuda Triangle type vortex), and after hearing about this special water I immediately thought this had to be why the water in that neck of the woods is different. The first prototypes of the GV were have made with a natural void in the middle of the disk, so to see what might happen I used a small funnel and poured water through the ready-made hole. Then I drank a cup of the stuff. Nothing much seemed to be occurring, but then after a few minutes I noticed a cool impression, almost like “running water” spreading out from my abdomen, which finally seemed to collect in my joints as a very pleasant feeling. The sensation slowly abated leaving me with nothing but that memory and no clue as to whether there had been any benefit. But it didn’t seem to hurt. Just write them a check for four or five hundred dollars and they’ll fix you up with a counter-top device that might do you a world of good. It’s not portable, but you can fill a bottle and take the water with you. Then I learned from my own experiments that this new water structure seems to be temporary, the hexagonal shapes reverting to “normal” pentagons in about 2 hours. But since I don’t have one of those Vitalizer machines I don’t know that this problem exists with it. What I do know is that the Golden Vortex restructures water in much the same way and easily goes with you everywhere. I also know that the “Ankh” version that I finally settled on now produces water that lasts indefinitely ... it does not revert in the bottle ... or in the body! Tough choice? $450 or $19.00 to check out the usefulness of “magnet water”? And both come with a money back guarantee. What’s going on with this device might even be the result of the placebo effect. You know, that’s when researchers give out new pills to half the people in a blind study, and then give the other half sugar pills to see if the real pills really work; a placebo. The well-known rub is that in most of these studies some 30% of the sugar pill takers report relief or cures! The people who do these studies know this happens and have to factor that 30% into the math results in order to come up with definitive answers to justify their final reports. The placebo effect is a small, back-of-the-mind problem for the scientific community ... and a problem most of them can’t place into a proper context by being able to honestly ask, “Just what is the placebo effect? Anyway, whether or not the GV works for you is basically up to you. Gurus who teach meditation and other forms of esoteric techniques tell you that to meditate properly you have to essentially think of nothing! Try that sometime. Sit or lie down and order your mind to just go blank. You get about a half-second into the exercise and you ask yourself what you’re going to fix for dinner. You are into to it, but worry about the phone ringing. Did you turn off the coffee pot? Yep thinking of nothing ain’t easy, Maynard. In fact, it’s the nearest thing to impossible to stop the internal chatter going on in your mind. Yet, as Don Juan pounded into his apprentice’s head, Carlos Castaneda, in order to do something along these lines, and to “sustain the effect”, you must, “... not do.” You must turn off the internal dialogue to be a successful sorcerer. Everything is intent. You don’t need anything else to make placebo “magic”. Intend to do something, and then think of nothing and you’ve got it made. The sign is there for fun ... mostly. Believers look at it, smile and know. True skeptics look at it, frown and wonder. Another form of visitor to the Vortex, a debunker glares, but also “knows”. Debunkers come into the Vortex knowing everything, and they leave knowing everything! We don’t mind. As obnoxious as some of them can be, we even like debunkers. They are necessary. We are convinced that totally closed minds that are literally unable to see what is right before their eyes helps keep this world ... this reality in concert. We’d be in deep trouble without them! Debunkers and as yet to be enlightened skeptics are the glue that holds everything together! The rest of us are just having fun at their expense. The reason you need to be able to not think in order to achieve a good meditation, or get from the Universe what you want is that getting from the Universe what you want only requires the intent to get from the Universe what you want ... you can’t order the Universe around! There is a protocol, you know. So, you set down, declare what you want; money, health, or anything, and then you let it all go and trust that your friend, the Universe will dish it up automatically just because you know you deserve it. Really! The reason you can’t order the Universe to do anything is not because you are hurting the Universe’s feelings, it’s because your own mind will step in the way of getting what you just ordered. Your mind is jammed into this reality so solidly that it won’t allow you to disengage it. Your mind has worked mightily to cement this world into some kind of sense and it’s not going to allow you to change the rules. So go ahead, try not to think of anything. Not thinking of anything is seemingly unachievable because, believe it or not your mind and its constant chatter qualifies, quantifies, and helps you make your reality as you go along. And a big part of that reality is knowing that stuff like meditation, instant healing, and magnet water ain’t part of the landscape! That’s right ... in small ways we can all be called, debunkers. The only way you can get what you want from the Universe is to state what you want, and then wait for it to appear without thinking about what you want. And the only way to pull that off it is to ... fool yourself. Of course you could spend a lifetime studying Yoga in order to stop thinking for 3 or 4 minutes, or you can get sneaky and do it instantly. The Golden Vortex can’t do anything paranormal. It’s just a plug on the end of the toaster wire. No matter where we are all of us are bathed in universal energy that’s just waiting dumbly to give you what you want. By analogy the toaster is surrounded by electrical energy swarming through wires in your house. It’s plugged into your house all the time, so that when you drop bread in the slots then push down the lever you’re expressing the need to have the bread come out crumbly and warm. You turn around, maybe pour a cup of coffee, or glance at the newspaper and before you know it ... magical toast! But if you hover over the machine cajoling it to hurry up it will seem to take forever to deliver the goods. Remember the adage, “A watched pot never boils”? If you hover around the demand you made to the Universe, the “pot” will literally never boil. Here’s what happens: Your elbow hurts. You “plug” your elbow into the Universe with the Golden Vortex by putting it on the pain spot with tape, or by sliding it under an elastic band. Then you pour coffee, look at the newspaper, and then drive to work. You are fooling yourself, because even though your earthbound brain never shuts up it can’t handle more than one thought at a time. You forgot about the GV on your elbow! Hours later you discover it ... on a spot that no longer hurts. You were making toast all the time! Do this kind of thing enough and pretty soon your mind gets the idea and adds what you are doing into its normal repertoire. Now you have really fooled yourself, sort of like how the Yoga guy trains to be able to think of nothing after 30 years of practice. Using the GV has become “normal” and part of your everyday reality, and since your mind can’t make judgments about what’s real and not real it accepts that which has become what is. Greg pointed out that the GV softens his hard water, makes his coffee taste less bitter, and it seems to ... clean his teeth. Terry found out the same thing about his teeth, and considered the discovery to be more magical than what happened to his disease. The last time I went to the dentist he stuck that sharp little steel implement in my mouth but couldn’t find any plaque to scrap off. I told him why, but his mind wasn’t able to wrap around the news. So, what’s the Golden Vortex worth? Getting your teeth professionally scraped might cost you a hundred bucks, and then six months later another hundred. On the other hand the GV runs $19.00 and you might be through having your teeth scraped for the rest of your life. If this neat little tool did nothing else? Well, you do the math. I Would Not Do It! Other than talking to folks at the Montana Vortex every summer I’m otherwise retired. Each GV has to be made by hand and tested at least three times on the way to fastening them together. I am actually desperately frightened that a hundred thousand people might want one of these things at once! Basically I just want to drink the water, go to bed with my GV, travel a little, hang out in my shop banging my head against the “impossibility” of getting that magnet motor to work, and die at the age of the average Hunza. I don’t really want to start a company, train dozens of people to put these things together, and then have to ride herd on them. But I’ll make one for you, and then whatever will be ... will be. That when they send a GV back because it doesn’t work for them that the first thing I’ll do is test it to see if it is actually functioning ... If it was my fault and sent to them not working I will send them a new one plus their postage, but if they sent me back a working GV, I’ll return their money post haste.